From Beast Kingdom. A PREVIEWS Exclusive! With Thanos' powers growing ever stronger the Avengers are having to up their game to keep up. Enter the Egg Attack Action EAA-072, the all-powerful Doctor Strange who is ready to fly into action and save the universe from annihilation! Beast Kingdom proudly presents the latest EAA based on the once famous, yet egotistical surgeon turned magical avenger and sole protector of the Time Stone. Take flight with the distinct Egg Attack Action styling, and use the levitating cloak and 26 points of articulation to soar high in the sky, all the while stocking up on magical weapons including the sacred sword of Vishanti and the Crimson Bands of Cyttorak ropes as well as wrist bolts! 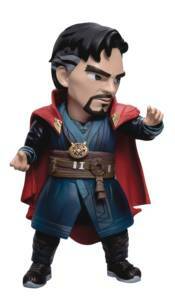 Exclusive to the EAA-072, channel the extra-dimensional energy to multiply the doctor's arms in the Image of Ikonn, ready for teleportation and time manipulation and with the included accessories, create mystic shields for protection or spells using the included divine medallion: The Eye of Agamotto. With a host of new accessories and options the Doctor Strange action figure offers collectors new and exciting ways to show off the Master of Mystic Arts!